Posted on Thu, Feb 23, 2012 : 7 a.m.
After a rough night shift, there are seldom any family members waiting up to welcome home a weary crime-fighter. Not that most cops would share their evening's sorrows or tragedies, but it would be nice to get a hug, kiss and smile from a loved one. That is why the majority of cops turn to four-legged, fur-faced friends who can hug and wag their tails quietly so as not to wake the officer's family. Scout "the Terrorist Terrier" and Tracy, both adopted from the Humane Society, were my greeters each night. Before them was Vanna "The Wonder Dog," who we adopted after my wife saw the lost beagle cross Washtenaw at Hill several times. Sadly we had to put Scout — the aged, Frisbee-catching, stunt double for the Taco Bell dog — down last Christmas Eve. Brandon was a black and white, 40-pound spaniel mutt who was rescued from the Humane Society. They say dogs parallel their masters and such was the case with Disco and his dog “Brandon.” Both had some incredible tales to tell and both were exciting to be around. Brandon was a black and white, 40-pound spaniel mutt who was also a rescued dog from the Humane Society. Disco told me the first thing they had to teach Brandon was how to go through doors instead of burrowing under them. Brandon had a habit of escaping by digging under fences. In the animal shelter he had used similar techniques to steal other dogs’ food from adjoining kennels. For this reason, fencing Brandon in was not an option. Fortunately, Disco lived on a lake in a very rural area. Brandon had another bad habit. He chased cars. One day Disco loaded up the family for an outing and Brandon started to chase the car. While Disco was driving and explaining to the kiddies that Brandon would learn on his own not to chase cars, the inevitable happened. Brandon got a little too close and got hit by the family minivan. Disco turned the family van into doggy ambulance for the first of many trips to the veterinarian. Brandon was patched up, good as new and was no longer an enthusiastic car chaser, preferring instead to bark at strange cars from his yard or walk out toward cars parking in the driveway. Brandon loved to go yachting with pal Disco on the family deck boat. Not liking fences, Brandon preferred to ride on the step below the deck, outside the rail, on the stern of boat. He would sit there watching the water and wake fly under him at 25-30 mph. When the boat slowed — or not — and he saw the spot on the lake he wanted to get off, he just bailed off and swam to shore. Even while the boat was anchored in the middle of the lake, when Brandon got hot or when Disco and family were not entertaining enough, Brandon would jump off and swim across the lake and go home. I spent all my young summers on a lake, and I never saw a dog do that. Brandon once got into a fight with a large groundhog. I am not sure how much wood that woodchuck could chuck, but it was in a fierce fight that was ending in a bloody stalemate. Disco, never the bashful one with his .357 magnum, decided to give his dog a little back up. He lined up a shot on the Punxsutawney stranger’s noggin and dispatched the varmint, but also hit Brandon in the paw. The doggy ambulance was fired up again and rushed old Brandon to the vet. Brandon was a tough old mutt and, in no time, was back on his paws and in action at the lake. Brandon loved to swim and explore around the lake. A short time after he had recuperated from his gunshot wound, Brandon met a species of animal endangered in every state except Michigan, where these animals are relatively plentiful in the swampy woodlands of southeastern Michigan. Brandon had a close encounter of the worst kind with a Massasauga rattlesnake. Brandon got bit and it was another trip to the vet’s office in the doggy ambulance. There was a problem, however, and since bites like these are rare in Michigan, a veterinarian from Alabama had to be consulted about Brandon’s care. After an anti-venom administration, Brandon was back in action. Brandon lived a long, legendary life and, in the end, was afflicted with arthritis very badly. Disco built Brandon a doggy ramp over the porch steps so his ailing friend could make it in and out of the house. One early winter morning, Disco let Brandon outside for his morning answer to nature’s call. Disco went about his morning ablutions and found Brandon had not returned. Disco called out for Brandon, but the dog would not return. Disco bundled up and went outside to see if he could track his best friend in the new fallen snow. Disco tracked Brandon out into the yard, around the house, toward the mailbox and back toward the house again. Instead of going to the door, the prints continued out on top of the ice of the newly frozen lake. Brandon’s last paw prints led directly to the last patch of open water on the lake he loved. Disco still misses his canine kindred spirit. Lock it up, don’t leave it unattended, be aware and watch out for your neighbors. Rich Kinsey is a retired Ann Arbor police detective sergeant who now blogs about crime and safety for AnnArbor.com. He also serves as the Crime Stoppers coordinator for Washtenaw County. Fri, Feb 24, 2012 : 2:10 a.m.
Thu, Feb 23, 2012 : 7:43 p.m. 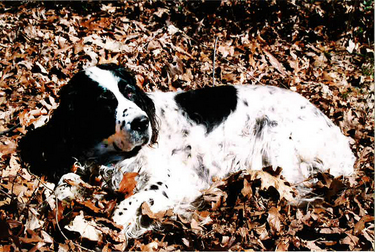 I had a black and white English Springer Spaniel - Ozzie - who was the sweetest dog on earth. His markings were gorgeous - he looked like he was wearing a tuxedo, with white paws and a white tip on his tail. Like Brandon, he had his share of close calls - falling out of my truck at Cherry Creek State Park in Denver, chasing a chipmunk across US 6 in Frisco, CO. He also loved to swim, even after an inadvertent dunk in the HIghline Canal when he was only 12 weeks...I had to fish him out by his collar. Sadly, I lost Ozzie to a rare type of cancer of the epitheliel cells at age 7. We were on a walk along Lake Tahoe and he simply collapsed...I dragged him back to the car, took him to the vet, and got the first news of the illness and had to say good-bye to him right then. I still miss him every day! Thu, Feb 23, 2012 : 9:15 p.m.
A dog that travels well is a real joy. Thu, Feb 23, 2012 : 4:14 p.m. I have heard many stories of old outdoorsy dogs that wonder off into the sunset when they know it is their time to die. Thu, Feb 23, 2012 : 7:58 p.m.
Thu, Feb 23, 2012 : 5:31 p.m. I've heard many stories about fairies living in the walls, that doesn't mean it's true. Thu, Feb 23, 2012 : 2:47 p.m. I love your stories....bet you have a million...please don't ever stop telling them here....unless you write a book!!! My big dog Major says WOOF ARROOOW ARF ARF ARF!!! Thu, Feb 23, 2012 : 1:04 p.m.
We had a dog who went through the ice one winter, too. Not pretty in the spring. Thanks for another really well-written story. You should compile them in a collection and publish them all together! Thu, Feb 23, 2012 : 1:03 p.m.
Thu, Feb 23, 2012 : 12:28 p.m.
What a life that Brandon led! I can appreciate good stories like this, and it's made me reminisce about pets that I've shared life with. Thanks for posting this - it made my day!